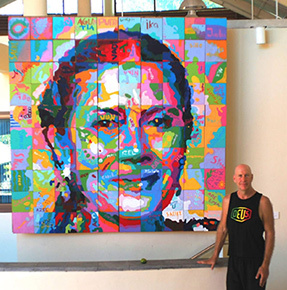 During the Bali Spirit Festival in Ubud, children each painted a 12 inch square that when assembled became a portrait of CNN Hero, Ibu Robin Lim. "Mother Robin" has been providing free health services to pregnant women and young children since 1995. She was honored to be CNN Hero of the year in 2011. This project made the children realize how their contribution and teamwork created something incredibly big and beautiful. An original concept by Stephen Bennet, this project took months to become a reality, bringing joy to entire community. 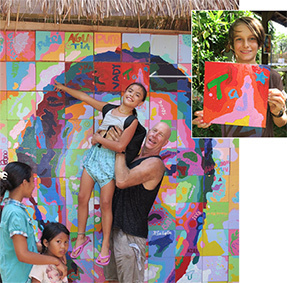 At left two proud children present their individually painted "pieces of the puzzle" that became a large 10x10 foot portrait of Ibu Robin Lim. 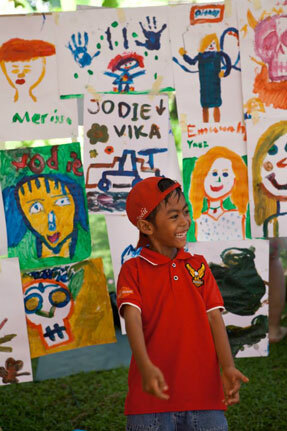 Amazingly, many of the children who participated in this portrait project were actually birthed by "Mother Robin". 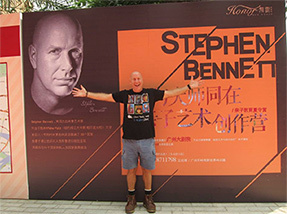 An Exhibit and and several Portrait Workshops were organized at the Guangzhou Opera Houseby Stephen. 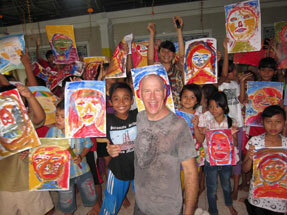 For fun, the children actually painted on T-shirts instead of paper. 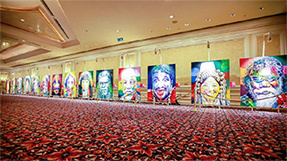 Faces of Light Art Exhibition was presented at The Venetian Macao which featured 14 large World Portraits measuring from 7x5 feet up to 10x9 feet. 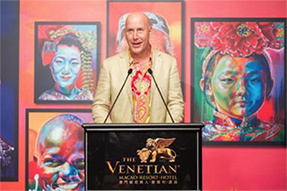 During this exhibit, Stephen Bennett gave special portrait painting class to young adult, visual arts students from Macao Polytechnic Institute, offering tips and demonstrating techniques. 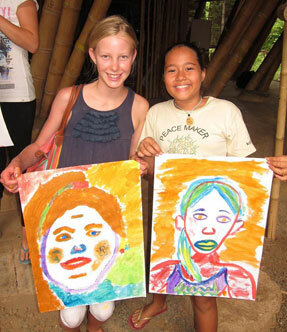 For the winter of 2013-14 Stephen Bennett, Amanda Carson and volunteers conducted workshops in Bali, Indonesia. 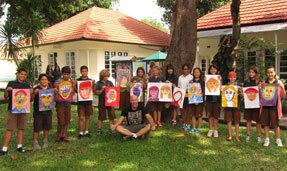 These workshops inspired over 250 young artists! 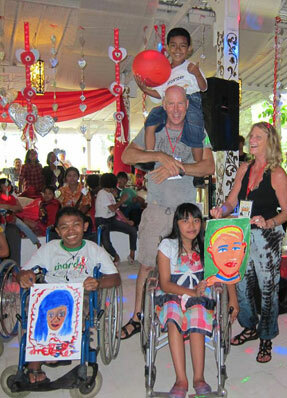 'The 5th Invitation to Love', A Valentines Day fundraiser for handicapped children and adults. 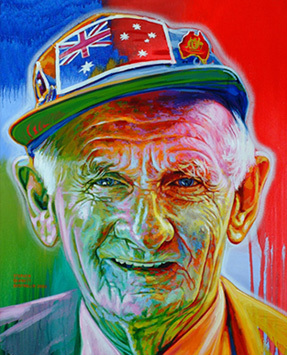 A large selection of Stephen Bennett's World Portraits-many of which are 7 x 5 feet will be on display. 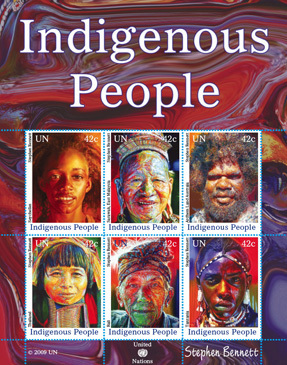 "World Portraits Exhibit & United Nations Stamps"
A selection of World Portraits-some of which appear on the latest Indigenous People series of 18 stamps produced by the UN Postal Administration for 2010 plus the 18 produced for 2009 will be on display. 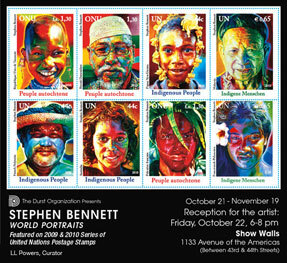 Second Series of UN Postage Stamps issued that feature 18 of Stephen Bennett's World Portraits. A selection of portraits from January 2009 United Nations exhibit, New York. 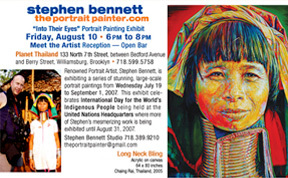 The United Nations Postal Administration is featuring Stephen Bennett's World Portraits for their 2009 Indigenous People postage stamps. 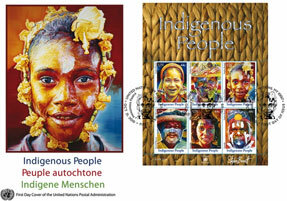 The series of 18 stamps will be issued in 3 countries and 3 languages at the United Nations headquarters/offices located in Austria, Switzerland and the United States. (Left) Sheet of 6 United Nations postage stamps specifically for the United States. All 18 stamps are available for purchase as of October 8 at all 3 UN locations. 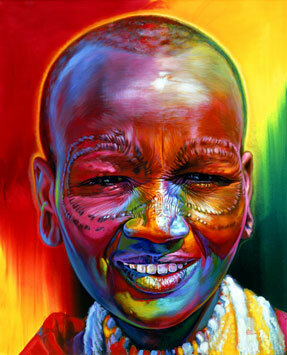 To see other designs, please click here. Please contact (347) 232 8996 for more information. 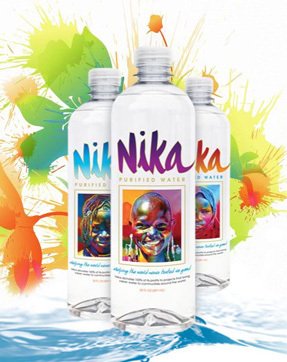 Please join us to celebrate the launch of NIKA Water! 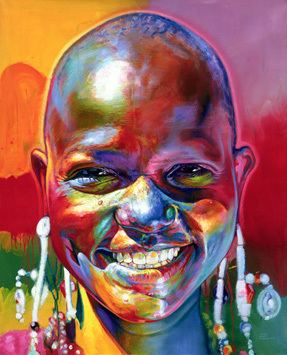 Stephen Bennett has donated his portraits to the NIKA label will also be at the launch together with some of his great artwork. 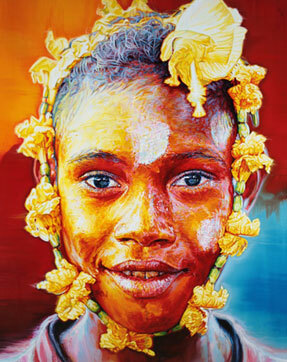 "South East Asia and Back"
The show in MV's Wolfe Gallery includes portrait paintings from Papua New Guinea, Thailand, Malaysia, Brunei, Indonesia, and Morocco. 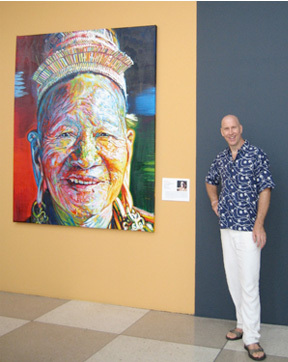 This exhibit is a preview of his upcoming show FACE to FACE, Uniting Humanity, at the United Nations Visitor's Lobby, New York in Aug. 2009. 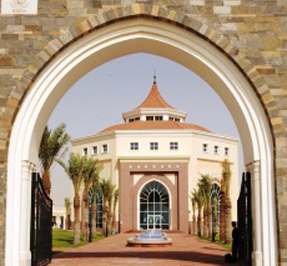 The group includes Mario Verta, Stephen Bennett, Rita Leistner, M.J. Alhabeeb, Anastasia Nelson, Davis Scott Woodard, Terry Mahy and Ernie Velasco. 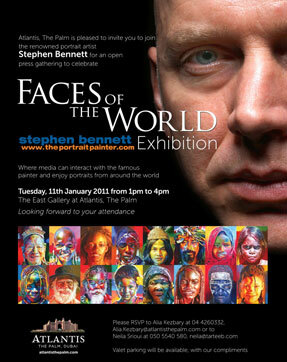 Stephen Bennett will show 12 images of his "Faces of the World" series. 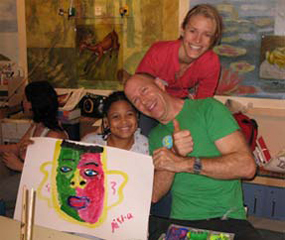 Join Stephen and Soaringwords in New Orleans as we connect with hundreds of children and families that were affected by Hurricane Katrina. 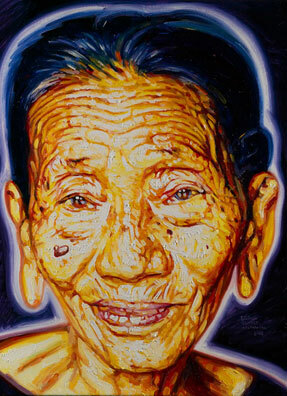 An exhibit of Stephen Bennett's large-scale (5'x7') portraits of indigenous peoples. 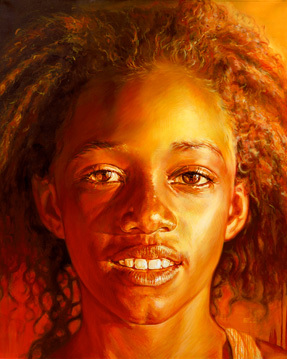 This previews an exhibit to be featured at the United Nations in 2008. 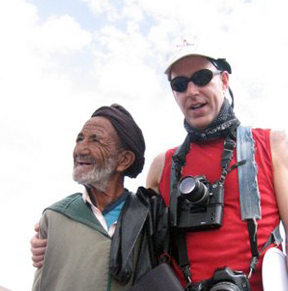 To encourage corporate sponsorship to benefit Faces of the World Inc. a non profit educational organization. 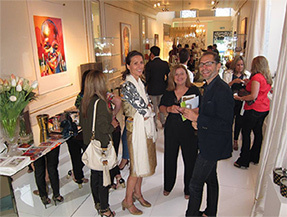 At the James Gray Gallery until December 16. 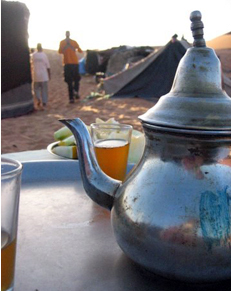 Toured the Erg Chebbi Dunes, Atlas Mountains, and surrounding countryside of Morocco, North Africa. 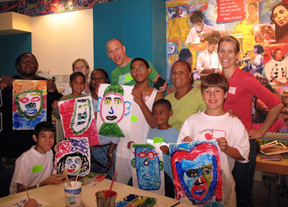 Read more about Stephenâ€™s trip to New Orleans at the Soaringwords organization website. Montifiore Hospital, New York. 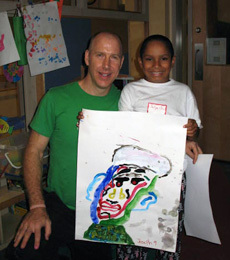 Stephen and his team help create colourful portraits and more importantly, â€œSoaring Smilesâ€�, in many wards at the Children's Hospital of Montefiore during workshops held there. 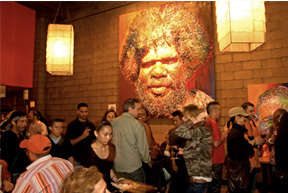 Williamsburg, Brooklyn until August 31. 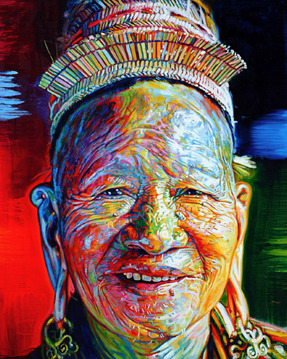 This exhibit celebrates International Day for the Worlds Indigenous People being held at the United Nations Headquarters. 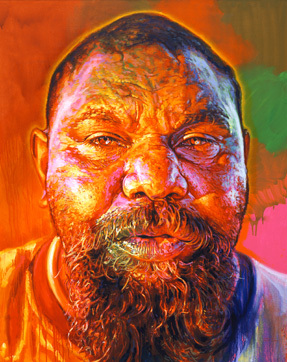 Stephen is presently in his New York studio painting portraits of peoples of Papua New Guinea, Papua and Peninsular Malaysia and Thailand. 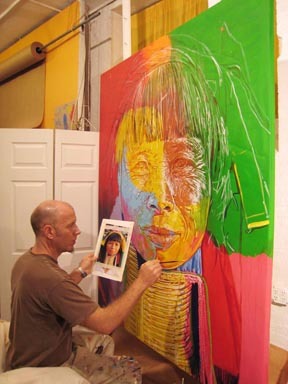 (Left) Stephen painting woman of the Karen Tribe from Northern Thailand. He only uses photos that he's personally taken as visual reference. 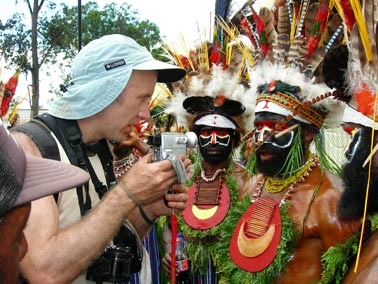 (Left) Attended the annual "Goroka Show"in Papua New Guinea to photograph and interview 80 tribes of Highlanders.These tribes compete through dance and colorful costumes made of feathers, birds, mud, beetles, moss, paints, animal hides, beads, plants and pleated leaves. (Left)Indigenous Asli children gather around Stephen in the Cameron Highlands in Peninsular Malaysia. 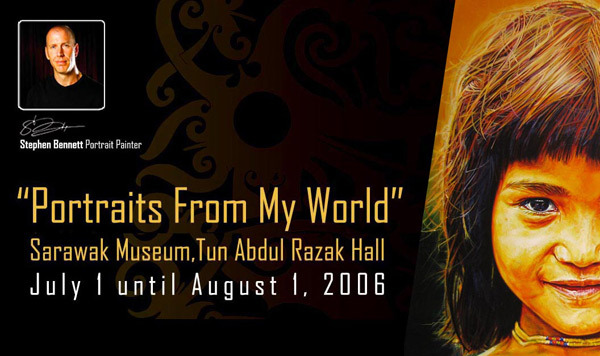 Exhibit of paintings at the Sarawak Museum, Kuching, Sarawak, East Malaysia and teaching portrait painting workshops at schools and cultural centers in Kuching.